This week's video on StampTV is all about creating a Memory Keeper Box. Gina challenged us to make a box after watching her video. She also provided a free template to use in creating this project. Click on the links to find. Stamp TV is such a great place for inspirations and designs. I encourage you to please check it out and join.. The box I made is to hold Valentine Cards ---ones I made to send and later ones that I may receive. My design was inspired by the card I made for STV color challenge which I have shown with the box in the lower photo. All directions and measurements are found in the STV Video so I am not repeating here. Gina gives such great directions to follow. And there are many videos to see while you are there. 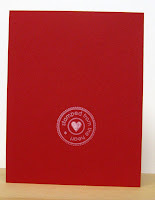 I finished my box by stamping a sentiment on red CS and heat embossed with white EP. Punched this out and matted on 2 circles cut with nesties. Finishing touch was the ribbon wrapped around the box and tied in a bow. Thanks for coming by. Please take time to visit Stamp TV. This will be a really quick post for a quick and simple card. This week's color challenge at STV is to create a monochromatic card. You can use any one color (and any number of shades of that color) of your choice and any neutrals you may need. 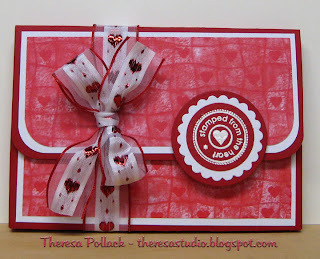 I used red, using the GKD Rocket Red Pure Luxury cardstock as my base. I did a simple card by using a patterned paper from my stash. I cut out a space in the center of paper that I trimmed along the design and placed on a white mat of Bazzill textured CS. 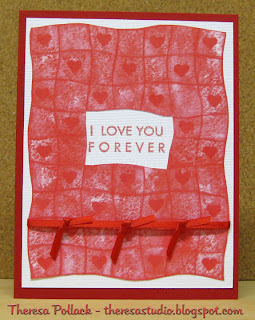 I stamped a sentiment from Melanie's "Inspiration Mosaic" in the cutout area. Added a ribbon with "fake" bows. I let the pattern inspire this design. So simple. On the back I stamped a GKD design from "Signed With Love" stamp set. Thanks for stopping by. Love reading your Comments. 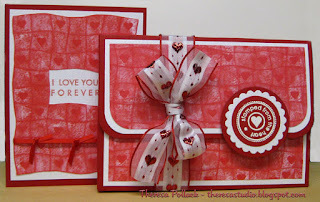 Selma at STV challenged us to make a card using Heat Embossing and also to use at least one heart on your card/project. 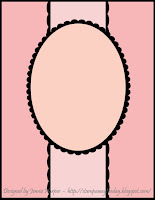 The heart can be cut out, heat embossed, dry embossed, rhinestones, brads ,etc.. . 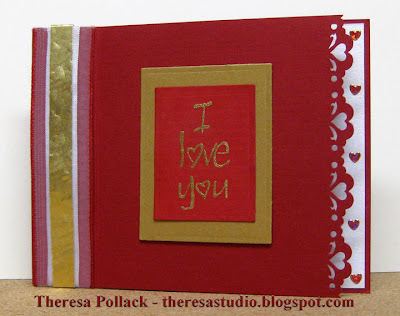 I designed this simple card using a red CS base on which I punched a heart border after scoring and folding. Added a strip of ribbon along fold edge and then attached a strip of gold CS that I dry embossed with mini hearts (hard to see in photo). Stamped sentiment with versamark and heat embossed with Gold EP on scrap of red CS. Matted this on gold CS and attached. Lined card with white CS that shows beneath punched hearts and finished with an edge of jeweled heart stickers. Sorry my stamp is unkown. All cardstock came from scraps and stash. Hello my blogger friends. I will not be making cards for a while. I had a bad fall on the street today and broke my right wrist. I will be going to an orthopedic surgeon tomorrow to see what he can do to repair the breaks.... yes, more than one break shows in the x-rays. Also banged up my right knee, left foot and my front teeth. Landed face down on the asphalt...nothing hurts as much as the fact that I tripped on the curb, not any ice. Clumsy me!!! At least I did not break my nose. We are packed and were ready to travel to TN tomorrow but are planning to postpone plans til Fri. My Mom's big party is on Sunday and I will absolutely need to be there for the party.....gratefully I have completed all the preparation and plans. Do have some posts planned ahead for the next few days but will not be able to make cards for awhile. What a bummer! Hope to be able to continue typing one handed. In all my years, I have never had a broken bone. Why now of all times? But I have had a very blessed life and this is a small thing to contend with when you think of all the many things that some people are suffering at this time. Thank God for my many blessings and a happy life. Jennie keeps coming up with great sketches at Stamp TV. Her sketch this week is shown on right. 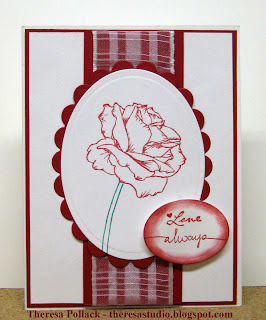 I used a Valentine theme and again used the rose stamp from Melanie's A Year Of Flowers...so simple but lovely. I used a base card of white layered with mat of rocket red. and another mat of white. I stamped the rose on white cs with red ink and stem with green ink and cut with oval nesties. Layered this on red mat cut with scalloped oval nesties. Used sheer white ribbon layered on strip of red cs. Assembled card as shown and added sentiment stamped on small oval and sponged with red. Thanks for dropping by and have a good day. Theresa's Studio Selected as a Favorite by "All Things Cottage"
Recently, my blog was selected as a favorite blog by All Things Cottage, a great website loaded with interesting information about cottage living and articles on food and wine, gardens, vacations, home decorating, crafts, and so much more. One of their monthly features is to list blogs about cottage living and other interests. I was honored that Theresa's Studio was recently listed in their favorite blogs. How exciting!!! Please check out this fun place by clicking on "Website" or "favorite". This is one website that you must visit and will bookmark to return to often. I know that you will find many articles of interest! Thanks to All Things Cottage for selecting my blog as a favorite! 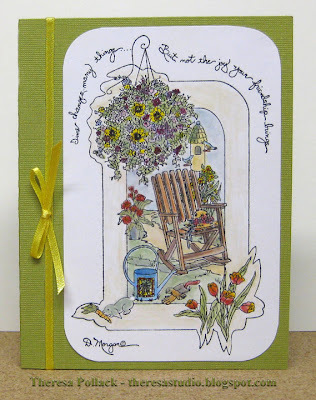 It was so much fun thinking of spring as I did Gina's challenge to create a project inspired by the cover of a gardening book that I decided to do another card. I stamped the garden scene with black ink on white CS and colored with pencils. I cut out the design and use a corner punch to round the corners. Attached this to a green card stock. Added a yellow ribbon to balance. As I look out the window, the snow continues to fall and the thoughts of spring are far, far away! Thanks for dropping by on this snowy day! and create a project inspired by the cover of a Gardening book, "Container Gardening". I searched my photos from last spring and found this picture of closeup of a violet that shouts spring. The base CS is green matted with a bright blue that matches the color of the violet. Added some yellow and blue to the violets with colored pencils. 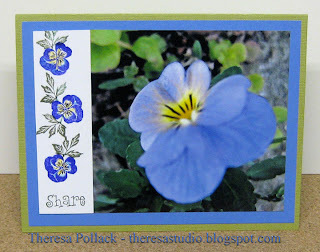 I stamped a strip of white CS with violets of lilac and leaves of green and a simple sentiment "Share" because this is a great photo to share. Attached the photo with the strip to the card. Think Spring! Thanks for stopping by for a look. First Time to Post This Year....Sorry I've Been Away! Hello, everyone. I have missed making cards and blogging with my friends in cyberland. I have also missed dropping in and commenting on your blogs but hope to catch up soon. It has been 2 weeks since I have posted on my blog and am sorry it has been so long. 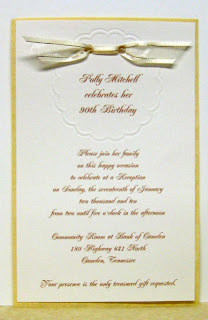 I have been busy preparing for my Mother's 90th Birthday Party. I mailed the invitations that I made (shown to the right) the first week in December. I have made the centerpieces as well and will show photos at a later date. I also did a DVD movie of pictures of Mom from 1920 thru 2009....that took a lot of time. I may be in trouble with showing this movie since she told me "No picture slideshow at the party. "..but will take my chances. above. Click on picture to see more details. Glad to be back...will be glad to see a comment when you stop by!